Original GIA report ships with Item- we also include our comprehensive appraisal, free of charge. Say you want a very deep yellow color- something a lot more than a light yellow- a yellow which is quite......intense. Well, here you have it. This is a Fancy Intense which is close to a vivid. In this case the fact that the clarity is SI2 does not make the stone less expensive than a VVS- the reason? In fancy colors a stones intensity of hue has a far greater impact on the price. 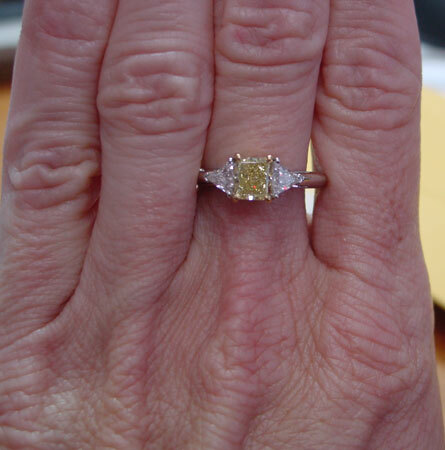 For example- a VVS1 Fancy Intense Yellow which is closer to Fancy Yellow ( the adjacent lighter, less expensive shade) could easily be less per carat than this , close to vivid stone. 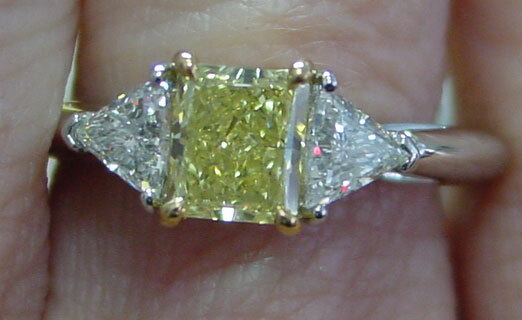 The medium blue fluorescence, visible in the photo below- actually makes the diamond look even deeper in yellow- this is the case in a small percentage of Fancy Yellow, and Fancy Intense Yellow diamonds with Medium Blue. The actual three stones shown above prior to production. one of the great benefits we offer our clientele, is a liberal trade up policy. 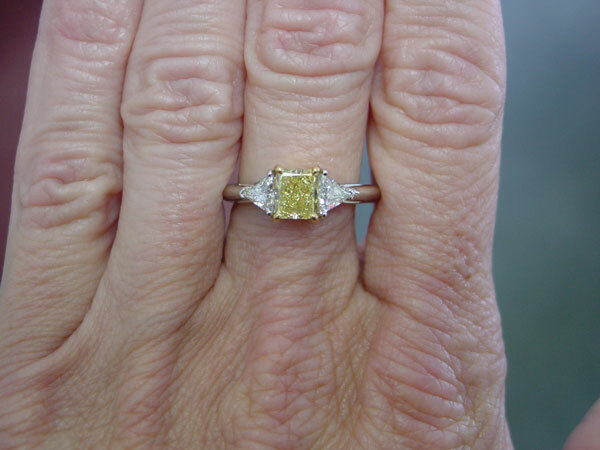 People tend to keep our rings in great condition, and generally we allow the trade-in value for the ring, as well as the valuable center stone. The great thing is, the merchandise does not go down in value, if anything, it goes up. 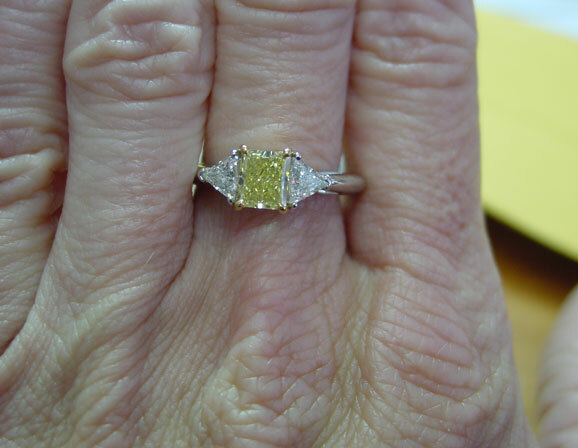 ALL photos are of the actual diamonds and ring.